Floyd Norman is a guy I could easily sit down and talk to for hours. He’s a veteran animator, writer, and comic book artist who worked on such Disney classics as “Sleeping Beauty”, “One Hundred and One Dalmatians”, “The Sword in the Stone” and “The Jungle Book” as well as Pixar greats like “Toy Story 2” and “Monsters, Inc” – which something very few can include on their resume. 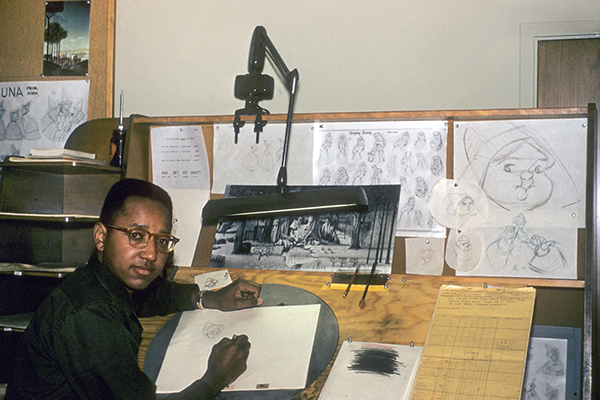 He’s called “the Forrest Gump of animation”, since people don’t realize all that he’s done professionally, but he’s mostly known for being the first African-American animator hired by Disney back in 1956. That alone is reason enough for directors, Michael Fiore and Erik Sharkey, to make a documentary about this humble legend. 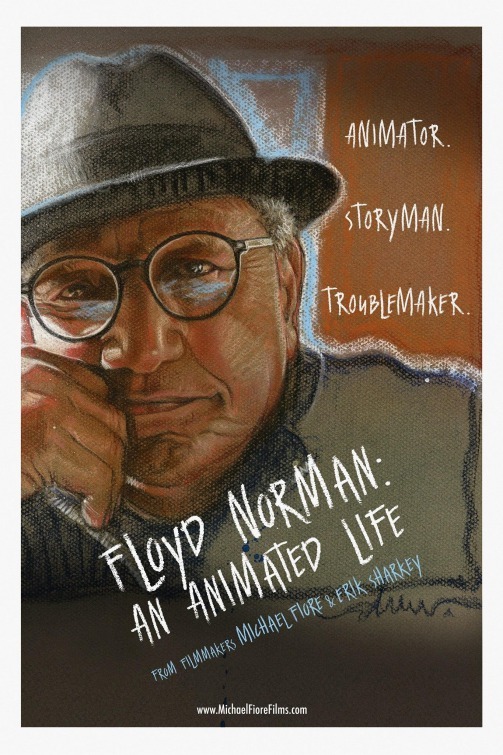 Here is a man who’s lived and loved his work for seven decades and “Floyd Norman: An Animated Life” sets out to cover that life – from a quiet young man who starting inking pages for Bill Woggins’ Katy Keene comic to the elder statesman who offers input and advice to today’s up-and-coming Disney animators. 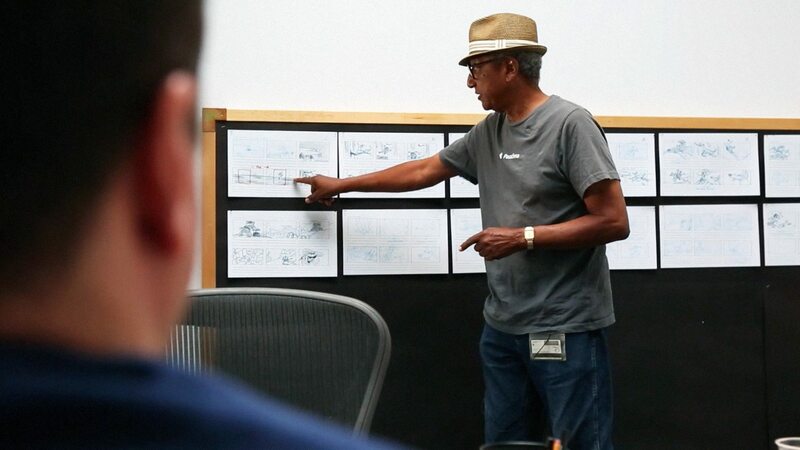 The goal of “Floyd Norman” is clearly to introduce the artist to those who never heard of him, while maybe offering some new insight into his life for those aware of him. If I were to describe this documentary to others, I could say “it’s about the first black man hired by Disney back in the early 60s”, but that would be a disservice to the film, since Norman himself never really thought much about all that. It’s clear he sees how significant that was, but he recalls here that when he was hired at Disney he was just a young artist looking for work. He was chosen because of his talent – not his skin color – and began working right around the time the infamous 9 OId Men (Walt Disney’s core animators) were close to retiring. He started out as an “inbetweener” (someone who draws the 2-7 , out of 8 steps, of a character in motion) for 1959’s “Sleeping Beauty”, where he was also assigned to the unit that specifically designed the three fairies. Of those nine animators, Norman would receive support from Ward Kimball (“Pinocchio” and “Alice in Wonderland”) and eventually work closely with Milt Kahl on “The Sword and the Stone”. Fiore and Sharkey are interested in showing viewers who Norman is as well as what he’s done in his long career though. Born and raised in Santa Barbara, California, in a community that encouraged the arts, Norman acknowledges that he had something of an idyllic childhood, one with very little hardships or the effects of racial segregation that so many other African-Americans were experiencing in other parts of the nation. He was also drafted into the army during the Korean War after his work on “Sleeping Beauty” and was grateful to return and get back to work at Disney where he worked on “One Hundred and One Dalmatians” and “Mary Poppins”, among others. He was soon hired on as a story developer for “The Jungle Book”, where he worked closely with animator Vance Gerry specifically on the musical sequence with Kaa the python. This developed after once Walt saw the quick inter-office sketches that Norman would post as acerbic jokes in a way to let off steam and satirize the man who created the Mouse. I got a kick out of these drawings – which showed a different side to the congenial Walt Disney fans were accustomed to. What I found most interesting was the period in Norman’s career after Walt died in 1966. This is when he and fellow colleague, Leo Sullivan, founded Vignette Films, Inc. – an all African-American studio also composed of Richard Allen and Norm Edelen. The foursome would produce their own animated films, but also created produced Black Profiles shorts, which covering pivotal moments in black history. “An Animated Life” even covers a time in August 1965, when Norman and Sullivan drove down to the Watts riots in Los Angeles and filmed looters and protests with a camera Norman bought off Roy Disney. Their footage wound up getting air time on an NBC report. Although it’s clear Norman was and is an easy-going guy, such a decision to capture this important moment in time shows a desire to do something with his talent beyond entertainment. Norman felt he was contributing to society by documenting what he witnessed, which reminded me how powerful being in the moment can be. In the late 60s at Vignette, Norman and Sullivan found themselves working on two iconic moments in African-American animation. One was the character designs for the original Fat Albert series “Hey, Hey, Hey, It’s Fat Albert” and the other was the animated train intro sequence to “Soul Train”, which debuted in 1971. Both of these television had a huge impact on the African-American community, but also television entertainment as well. His heart was always with Disney though and eventually Norman went back to work for the studio in the 70s. He worked on “Robin Hood”, yet seems dismissive of that particular feature, stating “it wasn’t that good” and was the last artist to work on the Mickey Mouse comic strip which would end its run in the early 80s. Once Pixar Animation Studios kicked off with “Toy Story”, the studio tapped the shoulders of certain Disney veterans who weren’t getting that much work anymore. This resulted in Norman working as a storyboard artist for “Toy Story 2” and “Monsters, Inc” and then back to Disney for some work on “Mulan” and “The Hunchback of Notre Dame”. To this day, Norman continues to get freelance consultant work for Disney, now that they’ve “rehired” him. Throughout the film, we hear from Norman himself as well as family members, colleagues and professionals who respect his legacy. It’s most interesting to hear from his ex-wife, Belle Norman and their five adult children. One gets the idea that Norman was often consumed with his work over the years and may not have always been available for his family, which is often the case with full-time artists. But the goal of “An Animated Life” is to celebrate this youthful octogenarian, so we also hear from the likes of: Whoopi Goldberg, Leonard Maltin, Paul Dini, Don Hahn (Disney producer), Gary Trousdale (co-director of “The Lion King”), animation historian Tom Sito, composer Richard Sherman, Dean DeBlois (writer/director of the “How to Train Your Dragon” series and “Lilo & Stitch”) and fellow cartoonists Scott Shaw and Sergio Aragones. 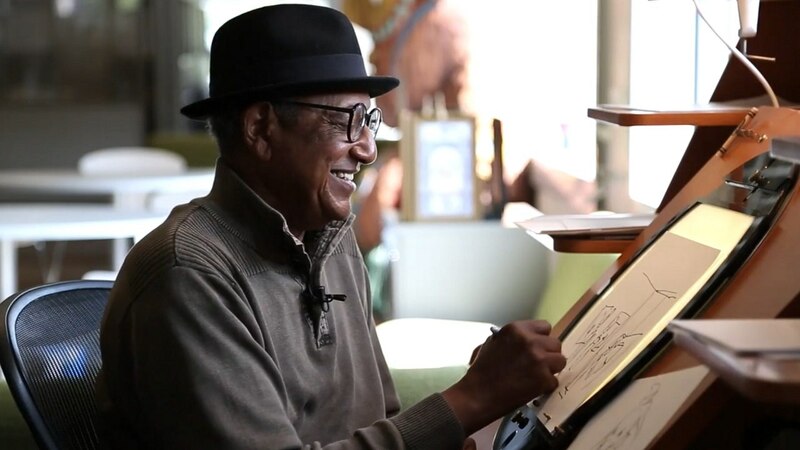 For Disney fans and those who know and respect the painstaking solitary hours slumped over a drawing board that animators endure, “Floyd Norman: An Animated Life” will bring you a knowing smile. It certainly makes me smile to see a content and humble artist get his due and to think that Floyd Norman still has many more years in him.